After returning from holiday I am back to school and my life continues in its normal paradoxical fashion, namely, my ability to be simultaneously stressed by and fed up with school. How does one both panic about something, and find it boring? It is a great mystery, but one we all understand. *We may not enjoy the workload March brings with it, but I doubt I'm the only one relieved that Valentine's month is over. Right now I'm feeling quite excited about Russian Formalism, which is a school of Russian literary theory wherein you make the familiar strange for your readers, thus forcing them to look at things in new ways. Cormac McCarthy uses it in The Road, which is the book I'm studying for English. It's a bit of a corker. I am third drafting my novel, which at this point means I am finally taking what is basically the one and only accepted and agreed-upon redrafting step: to reread the book, all the way through. ... but I spend the rest of the time cringing and writhing and figuratively sobbing at how awful it is. So yeah. It's a very healthy balance. In other news, it's time for Starting Sparks! Bowing to bloggy peer pressure, I have created a page for Starting Sparks. (I'd been meaning to for a while, and then I saw that Ashley has done so, and I felt obligated.) So, rather than giving you the spiel on what it is, I can just direct you up there to that snazzy page, and you can see for yourself. So. My normal tactic for finding SS prompts is to check out my Pinterest Writing board and see what takes my fancy. (I'm properly professional, I know.) But this month I was feeling rather uninspired by this course of action. So, what does inspire me? I wondered. 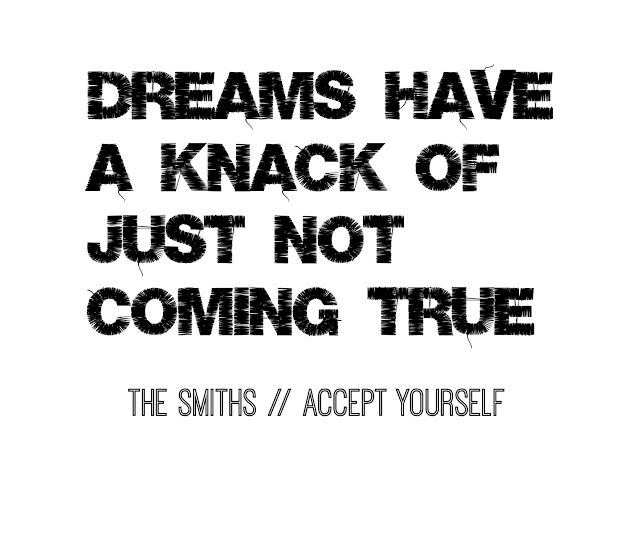 A little background: The Smiths are a famous British band. To love them is a rite of passage through a British teen's years. They are very very important to me, increasingly so over the past few months. If you want a top-class album experience, listen to Hatful of Hollow. I will talk a lot more about the Smiths when I come to share my own Starting Sparks story, but for now, suffice to say that the Ruskins, the four siblings in my foetal novel A Room Alone, all love them very much. They are not BFFs, those four -- they fight quite a lot -- but the Smiths bring them together. I've decided that the music, therefore, will play a big part in the book. All in all, what we can take from this is that this is an utterly self-indulgent prompt because I want to write about my favourite band and my lovely little-known characters. But I hope you guys will be able to work with it too. I'm seeing angsty, upset stories from these lyrics; but I'm also seeing the potential for fantasy, because, hello, dream magic is very, very cool. Have you read The Dream Thieves (sequel to The Raven Boys)? If not, why not? I do the same with school to. Does it make sense? No. I've seen that tumblr post though and thought YES! THAT, THAT RIGHT. . . I HAVE NO MORE WORDS, JUST THANK YOU! It's so unfortunately true. Whoop! Another Ruskins post! I'm excited on that front. And I did listen to Accept Yourself. It's rather nice. I'll have to give The Smiths another listen soon. Have you read TRB sequel, she asks. "If not, why not?" I'm sorry, are you telling me something? There's some static on the brainwaves. Your message isn't quite coming through. But really, I'll read it. Just later. Me too! I've been planning Matthew's life all day! (It'll be about him.) AND YES YOU MUST. Great idea for your Starting Sparks! I can relate to that feeling of being fed up with school, but still caring enough to want to get "A"s on every assignment! March is a crazy month, but I just keep reminding myself that soon it will be summer. Right?! And yes. It will. SUMMER WILL COME. IT WILL NOT BE ALWAYS WINTER. OR NEVER CHRISTMAS. I'm really hoping to be able to participate this month, and this is an AWESOME prompt. So we'll see how that goes! Hmmm, I agree. 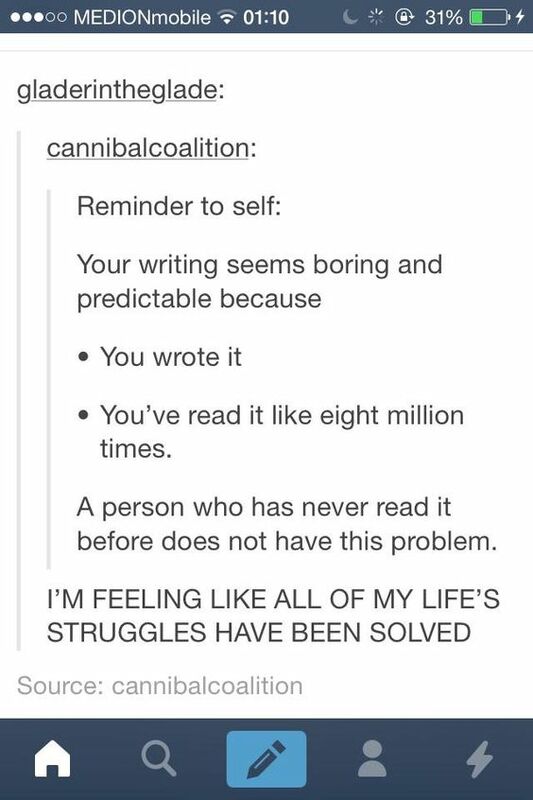 Reading your own writing is super hard. That is definitely my least favorite part of the process! And I've never heard of The Smiths!! It's so weird how music between continents differs haha. I'll have to look them up later :) I love how you've decided to bring them into your story!